[3.0] New Meta?! Cast on Melee Kill Dark Pact?! 2c Starter Budget?! 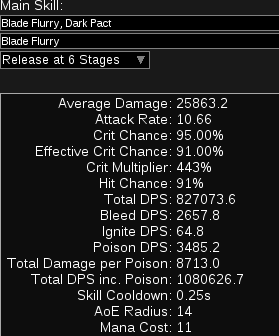 5 Million DPS Single Target?! Welcome to my first 3.0 guide! Do you want to play something unique? Something that will make your friends laugh at you for trying? Then you are at the right address! This build is THE underdog of 3.0, Dark Pact is just awesome with Cast on Melee Kill! This is also awesome for Uber Lab and Atziri farming with this much dps! Uber Lab - Coming Soon! This tree focuses on a healthy mix between life nodes, claw nodes and chaos damage. Vaal pact because the normal % regen / second cap on life leech won't cut it. I just love this support... With 39% MORE Spell Damage it's pretty much any other support gem you would normally pick and with 0.25 sec cooldown it will always proc ( Unlike Cast on Crits's 0.5 sec... ) We have culling strike and 100% more crit chance vs low life enemies to secure last hits in parties or solo! On high health packs you just proc your worm flask, it poops out 2 worms which you can kill to trigger cast on melee kill! This will help alot! I just see this as a mini-game where I have to decide if I need to use worms or if they die fast enough without. I tried Cast on Crit but because of the 0.5 sec cooldown Cast on Melee Kill feels ALOT stronger! Cast While Channeling > Cast on Crit if you don't like Cast on Melee Kill. 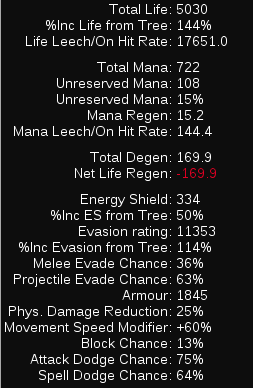 This dps is with max poison stacks! Blade Flurry doesn't work with Scepters so it will attack with The Wasp nest only! Both are about equal, Cospri is better when doing maps and Dendro is better when farming bosses because bosses have 60% curse effectiveness. See Gear section for my current links! Grab Essence Drain and Contagion and put Essence Drain + Void Manipulation + Controlled Destruction ( Arcane Surge till 18 ) in Lifesprig or any other decent wand. You can vendor a blue named wand with a chaos gem like Essence Drain and you will get a wand with +1 level to chaos gems in return. Try to use a 3 linked wand for this recipe! and put Dark Pact -> Void Manipulation -> Added Chaos Damage ( Faster Casting till 31 ) -> Controlled Destruction in it, run Blasphemy + Warlords Mark with this and it will be the easiest leveling you have ever experienced! Equip The Wasp Nest, Dendrobate and Singularity and follow this guide! I wish i didn't start playing before this topic was posted. Very nice build that i would definitely go with! Probably the only working COMK build I've seen so far. I'm actually surprised at the complexity. Saw you almost died a few times in the vid. Would it be more effective for you to lower your dps by a bit to grab some more life? People were using cyclone for actual melee builds, so we nerfed it and made blade vortex. Also, we went ahead and made cyclone great for CoC casters while we were at it. whould blade flurry - cast when channeled - dark pact be better? skill point progression? where to first? It works but it's 9% vs 39% multiplier, 0.35 cool down vs 0.25, can't link 2 dark pacts and also hard to roll another blue on cospri and also hard to change to another blue for single target. Probably better in endgame maps where you don't instakill mobs.